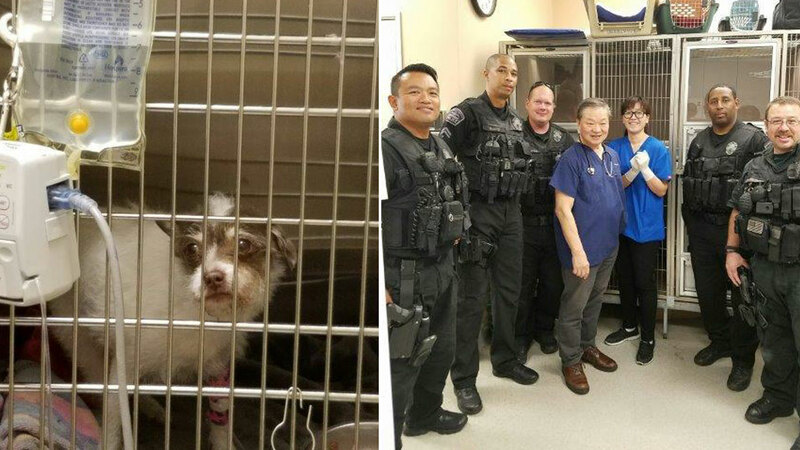 LOS ANGELES, CA -- A dog named Roxy who was hit by a car is recovering at a Los Angeles veterinary center, thanks to the quick actions and kind hearts of airport K-9 officers. Los Angeles airport police K-9 Officer Havon McLeod was driving to work Monday on a freeway when he noticed cars ahead of him were changing lanes and slowing down when they passed by a car. McLeod thought the car had broken down or an accident had occurred, so he stopped to see if help was needed. When he approached the car, he found out the driver had accidentally hit a small dog. The officer quickly assessed the dog, found out it was severely injured and was wedged under the car. He and the driver, a United Airlines pilot, used a jacket to remove the pinned down pup and rushed it to Westchester Veterinarian Center. Center staff evaluated the dog, who was identified as Roxy by the collar she was wearing. Her family was notified. McLeod called in later to check on Roxy and was told she would be put down because her family could not afford her extensive surgeries. He informed his fellow airport officers about Roxy's fate, and they quickly decided to save her life. He, along with five other officers, pitched in and collected $400 to pay for her reduced medical expenses. She underwent surgery and is expected to make a full recovery.